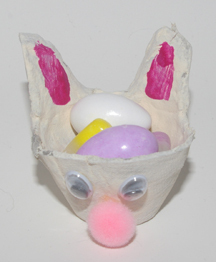 Cut just right, an egg carton cup ends up with perfect “ears” for a tiny bunny Easter basket! What You Need: egg carton section; scissors; white paint; pink paint; 2 googly eyes; pink pom pom; glue. How to Make It: Adult cuts egg carton section apart, leaving 2 edges intact in shape of bunny ears. Child paints bunny. After paint dries, glue on eyes and pom pom nose. Fill with candy! This entry was posted on Friday, March 14th, 2008 at 10:33 pm	and is filed under Easter crafts, egg carton crafts. You can follow any responses to this entry through the RSS 2.0 feed. Responses are currently closed, but you can trackback from your own site.